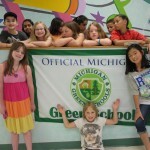 Earn a MI Green School point! Recruit 3 to 4 captains to spearhead various responsibilities. Meet to review MI Green School points and divide responsibilities. To ensure everyone gets hands-on participation, create subgroups such as Michigan Green School, Recycling and Earth Day Event. The entire team can meet once a month for an activity (see GT Activities for monthly suggestions) and then subgroups meet based on project requirements. 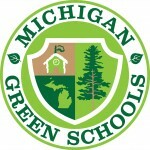 If you live in Michigan, the Michigan Green School Achievement award is a terrific stepping stone to get staff and students engaged in green efforts. A list of environmentally-friendly initiatives provides your school with a checklist and common goals. In April, the awards are announced just in time to celebrate Earth Day and be recognized for all the hard work! Begin assessing points and strategize early! The application deadline is March 1st. Achieve the greatest impact by including the entire student body in collaborative efforts to earn points. Find your County Coordinator here!